Hello! 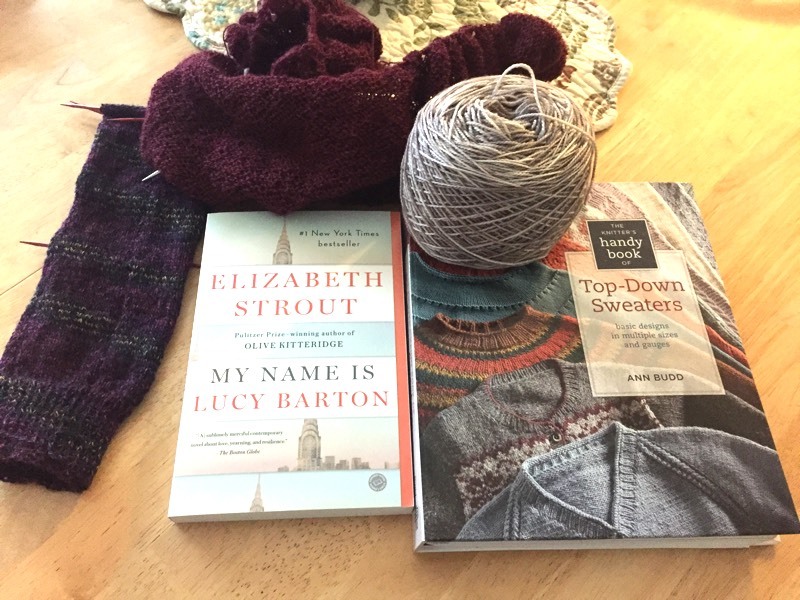 I'm thrilled to share with you my knitting and reading this week. On my Asana Shawl, I've reached the lace and beading section. Beading my knitting is right up there with pure bliss. If you haven't done any beading you should. I highly recommend the dental floss technique of placing beads. Ingenious!! My sock, oh my sock....I am done with the first one and am starting the second sock. I'm doing the afterthought heel trying to maintain the integrity of the disappointing striping. I love Trekking XXL sock yarn but this colorway is quite disappointing. 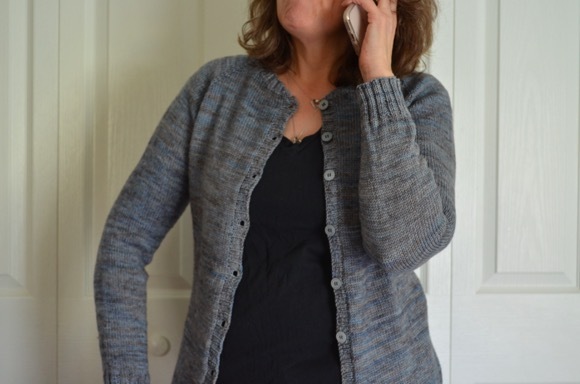 Last but not least, I'm thinking of knitting another top down cardigan sweater. I loved all of your suggestions in this post but I keep wearing this and this every single week. So I'm going to do another one, minus the lace insert. Now I just have to find my notes.. I continue to read The Sellout which is not a quick and speedy read. Following the heels of the monumental mammoth reading of Alexander Hamilton, I'm having attention troubles at night when the reading is dense. This book is a daytime only reading book for me. So I'm reading My Name is Lucy Barton as my bedtime reading. Your Asana shawl is a beautiful shade of purple and will be even lovelier with beads. I enjoyed Lucy Barton, and am now reading a sort of sequel, Anything is Possible, which has vignettes of people mentioned in Lucy Barton. Happy Knitting and Reading! What a nice sweater. I have been losing a battle with another head cold so I am stalled on reading and knitting this week. Just little bits in between napping. great knits lining up!!! I'm having trouble doing multi-project knitting these days....what's wrong with me??!? I started a sock only because it is a MKA, but keep going back to a shawl that has worn out its welcome in my knitting world, but I can't seem to let it go. ???????? eep! The sock looks good, Karen. I'm sorry the striping was not exactly the way you would want. I can truly understand why you want to do another of the cardigans like you've made previously. They both are absolutely stunning! I'm certain one made without the lace inset would be just as lovely. Thanks so much for the updates on the books you are reading! I love top down sweaters. Thanks for beading link...I want to try it. I'm reading The Universe Has Your Back during the day and The Mermaid of Brooklyn at night. Knitting...fingerless mitts, they are easy and I can pick them up and put them down during the day with kiddos around. Your knitting is great and all, but OMG! Let's talk dental floss. Thank you SO much for sharing that link. I'd never heard of that method, or type of floss before. I usually use loose beads & a crochet hook because I just can't handle the thought of counting & threading beads, possibly in a specific order, onto my yarn. But the dental floss.... The dental floss method makes a beading project portable. I can knit with beads at work, in the car, on the beach..... You're my hero! Those sweaters are so lovely! And, beading and knitting is indeed fun! I cannot wait to see your shawl finished! Love Top-Down sweaters book - such a great resource! The grape color of your shawl is just wonderful - will look great with basically anything, a true wardrobe staple! Lovely yarn colors. Always fun to see what everyone is reading and working on. Dental floss ... who knew??!!!!!! Thanks! Have a lovely week. 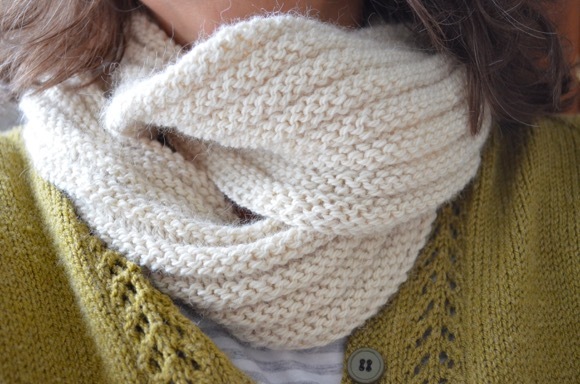 Beautiful yarn and knitting. I don't bead, but who knew about dental floss? Cool idea. Just looked up your bedtime read. Looks intriguing. I've started The Sellout, but am only on page 20. So far, so good! If you love wearing the pattern, go for it. Changing little things here and there makes it an individual. I don't believe I've seen this method of beading; very neat. One day I will try it. I do need to try beading. And I need to try sweaters, I love yours! I have Lucy Barton on my TBR pile, it's a book group selection for---sometime this spring, I can't quite recall when. The two cardigans are lovely. I do like that Tern yarn also. I just frogged about an inch on the one I'm working on. Maybe I shouldn't try to read a pattern after 9 p.m. At least that is my excuse. Ah - more knitting. I put the Lucy Barton book on hold at the library. Sounds as if it is getting mixed reviews. You will have to let us know what you think about it. The dental floss beading technique was amazing, I have never used beads in any of my work before. I have added that knitting book to my Goodreads list. I love that floss beading technique. Your shawl looks so pretty and personally, I really like the colorway of that sock. I prefer a subtle stripe. I love those beautiful socks you are knitting. Yes, I totally understand how hard it is to keep attention on heavy reading material at night when you're tired. Hope you enjoy the end of the week! It's always fun to see your knitting projects, Karen. I just saw that E. Strout book at B & N; are you enjoying it"
I didn't get very far with The Sellout. It is too bizarre for my tastes. I do love E. Strout,though I haven't read that one yet.